Purpose / People credited with this unit standard are able to: prepare for inspection, servicing, and testing of a supervisory control and data acquisition (SCADA) system; carry out diagnostic, sub system,and ‘end-to-end' testing of a SCADA system; and interpret and analyse test results and complete compliance documentation for a SCADA system. Critical health and safety prerequisites / Unit 14287, Use and maintain test instruments used within the high voltage electrical industry, or demonstrate equivalent knowledge and skills. industry-specific equipment, procedures, and processes. 2Safety of personnel and plant must be prioritised during assessment against this unit standard. If the client safety requirements are not met assessment must stop. 3Performance of theevidence requirements must comply with all current legislation, especially the Electricity Act 1992, and any regulations and codes of practice recognised under that statute; the Health and Safety in Employment Act 1992; and the Resource Management Act 1991. 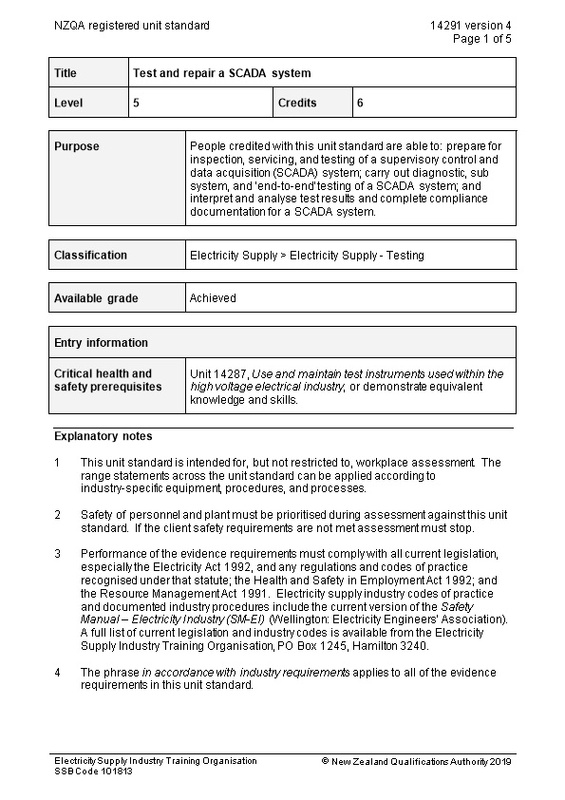 Electricity supply industry codes of practice and documented industry procedures include the current version of the Safety Manual – Electricity Industry (SM-EI)(Wellington: Electricity Engineers’ Association). A full list of current legislation and industry codes is available from the Electricity Supply Industry Training Organisation, PO Box 1245, Hamilton 3240. 4The phrase in accordance with industry requirementsapplies to all of theevidence requirements in this unit standard. 5Industry requirements include all asset owner requirements; manufacturers’ specifications; and enterprise requirements. Enterprise requirements may include the documented workplace policies, procedures, specifications, business, and quality management requirements relevant to the workplace in which assessment is carried out. 6Practical exercises should be used for assessment wherever possible. 7The unit standard covers inspecting, servicing, repairing, and testing SCADA systems. Testing is normally applied at electricity supply substations. SCADA =Supervisory Control And Data Acquisition. Prepare for inspection, servicing, and testing of a SCADA system. 1.1All equipment connected to the SCADA system is identified and its function described. Rangemay include but is not limited to – identification of the boundaries of data acquisition, data monitored, displayed and stored, master stations and satellite units. 1.2The function specification of the SCADA system and its operation are described. Rangemay include but is not limited to – as-built design changes, customer design needs, operational configuration requirements, operating modes, time adjustment tuning, software loading. 1.3The servicing and test methods are identified and described. Rangemay include but is not limited to – tests for all functional modes; equipment alignment and performance levelsdatabase management and functions. Carry out diagnostic and sub-system tests on a SCADA system. 2.1An access permit, or its approved equivalent, is obtained; and a safe work zone is identified. 2.2The required test and diagnostic equipment is identified prior to conducting the tests. Rangemay include but is not limited to – primary signal monitoring instruments, oscilloscopes, spectrum analysers, power meters, distortion meters, modulation meters, frequency counters, fibre optic level meters, light source. 2.3The input and output signals are measured for compliance with specifications. Rangemay include but is not limited to – open-closed, voltage, current, abnormal conditions, equipment availability, load limits. Carry out ‘end-to-end’ testson a SCADA system. 3.1The selected procedures and plans are followed. 3.2The results of the tests and inspections are recorded. Rangemay include but is not limited to – client requirements, values and signal functional relationships captured for analysis and interpretation. Rangemay include but is not limited to – equipment specifications, manufacturer’s operational safety regulations, personnel, equipment. 3.4Equipment component and system operation are restored to the specified level of technical performance. Rangemay include but is not limited to – manufacturer’s specifications. Interpret test results and complete compliance documentation. 4.1All recorded test results are analysed. Rangemay include but is not limited to – reference to design specifications, schematic diagrams, manufacturer’s requirements, client standards, previous test results, ensuring results are within given specifications. 4.2All non-compliant test results are investigated and corrective action taken. Rangemay include but is not limited to – rewiring, repair, investigation at remote external signal sources, adjustments, recommendations for further corrective action. 4.3Handover documentation and servicing reports are completed. Rangemay include but is not limited to – documentation completed with summary of diagnostic tests, sub system tests, servicing and/or commissioning, recommendations for improvement. 4.4Client post-repair needs are identified and prompt action taken to meet client requirements. Rangemay include but is not limited to – training, user familiarisation, user documentation, satisfaction, feedback, quality control monitoring, preventative measures and/or procedures. 4.5Documentation relating to the repair of equipment components is completed. Rangemay include but is not limited to – invoices, histories, project reports, stock reordering, sign-offs, warranties, contractual obligations. Please contact the Electricity Supply Industry Training Organisation if you wish to suggest changes to the content of this unit standard.